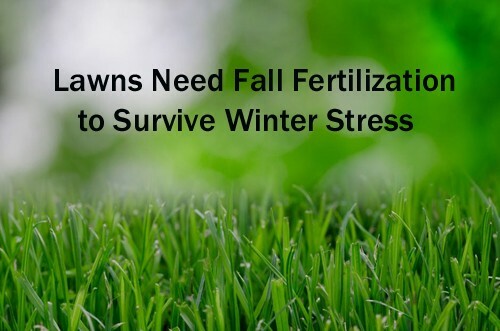 Late fall/early winter fertilization is the most important treatment of the year. Fertilizing your lawn, trees and shrubs in the late fall/early winter will help prevent disease and develop stronger roots. Fertilizing in the fall helps your lawn grow stronger roots, giving it a base to come back in the spring and thrive. It also helps minimize the damage that Central Indiana winters and disease can have on your grass. Most importantly, fertilizer provides a source of energy for the roots and will help with spring green up, which will help you enjoy a greener lawn sooner. Many people think they can save money by skipping fertilizing this fall, but in the end it could cost them more to repair damage done by weeds. Something is going to grow there, and we’d rather it be healthy, good standing turf, than weeds. Once you have weeds, you have to constantly be battling with herbicides and weed control. When you fertilize your lawn in the fall, your lawn is going to reap the benefits next spring. Fall Clean-up, Leaf Removal and Fall Fertilization is key to a full, lush, green lawn in the spring. Fallen leaves and lawn debris will brown your lawn, choke out your plants, and advance the growth of mold spores, lawn fungus, and plant disease. A complete fall clean-up prepares your landscape for a long winters nap, ensuring that it awakes happy and healthy come spring. GreenLawn by Design’s job is to make certain that your lawn has the best possible advantage going into the winter season. Have a lush, green lawn next spring by scheduling your fall clean-up, leaf removal and fall fertilization. Visit our website to learn more about our services and what we can do to help you get a healthy green lawn.